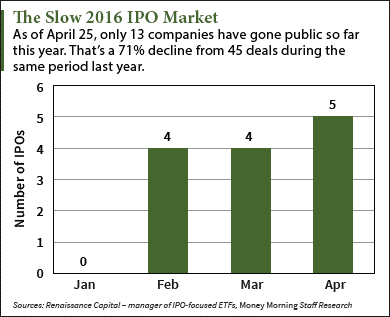 After only eight deals during the first quarter, the IPO market has finally started to pick up momentum. That continues with this week's upcoming IPOs, which include three companies set to raise $638 million. BATS Global Markets Inc. (BATS: BATS) is a global stock exchange operator that listed on its own exchange. It hit the market on April 14 and became the first non-healthcare deal of 2016. The firm raised $253 million and soared 22.4% on its first day. The firm is considered an "IPO icebreaker" – a strong, high-growth company that will help end the IPO drought. Despite the slow 2016 IPO calendar, the few companies that have gone public are beating the broader market. February IPOs AveXis Inc. (Nasdaq: AVXS) and Editas Medicine Inc. (Nasdaq: EDIT) are up 25.8% and 114% since their respective debuts. Meanwhile, the Dow Jones Industrial Average has gained only 3% this year. And Money Morning Executive Editor Bill Patalon – who has more than two decades of experience as a research analyst and financial journalist – says these huge returns indicate the upcoming IPO calendar will start to fill up. "Because strong IPO returns often follow periods of 'low issuance' – Wall Street code for a shuttered IPO market – we could soon see a big upsurge in IPO deals and big rallies in the prices of recently issued shares," Patalon said on March 11. Upcoming IPOs No. 1: Red Rock Resorts Inc. (Nasdaq: RRR) is a chain of 21 casinos based in Las Vegas. Back in 2009 when it was called Station Casinos, the company filed for bankruptcy after casinos were hit hard by the financial crisis. But the firm was resurrected in 2011 by owners Frank and Lorenzo Fertitta, who injected $250 million of their own money and changed the name to Red Rock. The Fertitta brothers, who also own mixed martial arts juggernaut UFC, will receive all IPO proceeds. The company posted $1.4 billion in revenue last year. It will raise $531 million by selling 27.25 million shares at a price range of $18 to $21. Red Rock is valued at $2.3 billion and will start trading on Wednesday, April 27. Upcoming IPOs No. 2: Yintech Investment Holdings Ltd. (Nasdaq: YIN) runs an online brokerage for trading precious metals and other commodities. With $102 billion in trading volume last year, Yintech is the largest online commodity trading firm in China. The firm is experiencing strong growth thanks to the 35% growth in the online commodity trading market since 2011. However, the company said it will be competing with Chinese online services firm NetEase Inc. (Nasdaq ADR: NTES). Yintech will generate $101 million by offering 7.5 million shares for $12.50 to $14.50 each. The company commands an $837 million valuation and will hit the market on Wednesday, April 27. Upcoming IPOs No. 3: Global Water Resources Corp. (Nasdaq: GWRS) is a water cycle management company. It primarily manages and operates wastewater utilities throughout the metropolitan areas of Phoenix, Arizona. Global Water posted 2014 revenue of $32.6 million and $24.8 million during the first nine months of 2015. It's set for a $6 million deal and will sell 1 million shares at a $5.25 to $6.25 price range. Although no specific date has been announced, Renaissance Capital reports GWRS will start trading sometime this week. Alex McGuire is an associate editor for Money Morning who writes about upcoming IPOs. Follow him on Twitter for the most important updates to the IPO calendar.